A component of a model hierarchy. Model Components form the heart of every JeVois application, as their main purpose is to allow 1) building complex vision processing pipelines from shared, re-usable processing elements; 2) a uniform interface for tunable parameters that these processing elements may have. In fact, every class which needs to expose parameters to the user should inherit directly or indirectly from Component. Parameters are simple wrappers around any valid C++ type, along with some description, default values, possibly specification of valid values, etc. Parameters are used to adjust the behavior of processing elements by allowing end-users to change the parameter values (think, e.g., of a threshold in some image processing algorithm). Beyond possible confusion about which value goes to which argument in the long list (which languages such as Python solve by allowing access to arguments by name), one major issue with this approach is that either every function using Canny must provide a mechanism for the user to set the parameters (threshold1, threshold2, etc), or, in most cases, those will just end up being hardwired, limiting the applicability of the end application to different image sizes, environment types, etc. One would typically first set the parameter values, then call the function. Setting the parameters can be done by the code that will use the function, but, more often, it is left to the user. In a particular vision pipeline, resonable default values may be provided for the parameters at the beginning, then leaving those parameters accessible to end users who may want to modify them. Modification of parameters in JeVois is handled either at the start of the application by parsing command-line arguments, when a new processing Module is instantiated, or while it is running, by interacting with the Engine that manages the system via its Serial ports. Any complex vision processing pipeline that includes the Canny component in its hierarchy will expose its parameters so that they can be set, either by users (via command-line arguments, commands issued over serial ports, etc), or by other components in the hierarchy. If multiple instances of a Component are present in a hierarchy, their parameters can either all be set at once to a single (shared) value, or they can be accessed and set individually to different values (each Component has a unique instance name, and a so-called descriptor is created by concatenating instance names of a component and all its parents; parameters of a specific Component instance can be accessed by prefixing that instance's descriptor to the parameter name). Parameters provide a uniform interface for setting/getting the parameter values, so that programmers do not have to program accessor functions in each of their components for each of their parameters(e.g., adding a Parameter<int> for threshold1 to your component will automatically add set(), get(), etc functions for it into your component). In addition, Component provides some level of introspection or reflection: one can access a component instance name, class name, descriptor that includes names of all its parents in the hierarchy, and iterate over its parameters, over its sub-components, etc. Component is inherently thread-safe and the component interface is written so as to encourage thread-safe use; for example, no function is provided that returns the parent of a component, as another thread could change that between the time that parent is returned and the time it is used. Instead, functions are provided that can traverse the hierarchy up or down in a thread-safe manner and execute some action on the components that are encountered during that traversal. Construction: In constructors, Parameter values have not been set yet so nothing that depends on them should be initialized yet. Typically, constructors should only initialize fixed component resources which are independent of Parameter values, or they can also set default values for parameters, which may later be overriden by command-line arguments. In many situations, the constructor would do nothing, and most of the initialization work would be delayed until the Parameter values have been set, during the component's init() phase. recursively call preInit() on all sub-components. run preInit() on the current component (the preInit() function can be overriden by derived classes to implement some custom initialization; note that Parameter values are not yet finalized at this point and should not be used yet). Manager then parses the command-line and possibly sets parameters. Parameters are considered ready to use from this point on. for parameters of this component that have a callback but it has not yet been invoked because that parameter has not been explicitly set at the command line, call the callback one first time with the default parameter value. This is so that callbacks that create resources (e.g., callback for a parameter for the device name of a device, which opens the device when called) are called at least once before init() is complete. recursively flip the state of all sub-components to initialized, then flip the component state to initialized. recursively run postInit() on all sub-components (derived classes may override postInit(), and would typically allocate resources that depend on parameter values in their override of postInit()), then on the current component. The initialization flow is fixed. Classes that derive from Component can override preInit() for intializations that do not rely on Parameter values and postInit() for those that do. Once init() is complete on the Manager, all components in the hierarchy are considered ready for operation. If a component is added to an already-initialized hierarchy, it will be brought up to the same init state as its parent at the time of addition. This is typically the case when one selects a new video format from a USB host on a JeVois system that is already running and streaming video. The Module handling the old format is furst un-initialized by Engine, then it is destroyed, the new Module is instantiated for the new format, and it is initialized before the stream of video frames is directed to it. postUninit() is called on component, then recursively on all its sub-components. Note how both init() and uninit() are private in Component, and thus cannot be called directly. Manager (and hence Engine which derives from Manager) makes them public so that you can call them on the manager. That is, your entire hierarchy is either initialized or not. Because powering up the JeVois hardware platform automatically constructs and initializes the default processing pipeline, and because of the aforementioned was in which Engine changes processing modules when users change video format, most components just assume that their vision processing functions will never be called when the component is not initialized, and thus they just skip testing for initialized() altogether (to save CPU cycles). Definition at line 178 of file Component.H. Each Component can hold Parameter objects (through inheritance) that can be set externally by users to modify the operation of the Component, and that can be accessed or set by the Component itself. Note how the JeVois framework uses inheritance for parameters as opposed to making them class data members of the owning Component. See Parameter-related classes and functions for detailed explanations. Each Component can keep track of a preferred filesystem path. Typically, users should not tamper with this, but Module objects (which derive from Component) that are dynamically loaded will have that path set to the path where the Module's shared object file (.so) was found. This allows those modules to access some of their local configuration data, which may, for example, be stored in an etc/ directory under the module path. Definition at line 32 of file Component.C. Calls uninit() if component is initialized. Definition at line 54 of file Component.C. If given path is relative (not starting with /), prepend the Component path to it. If path is absolute, no-op. If path is empty, return the Component's path as set with setPath(). Definition at line 515 of file Component.C. 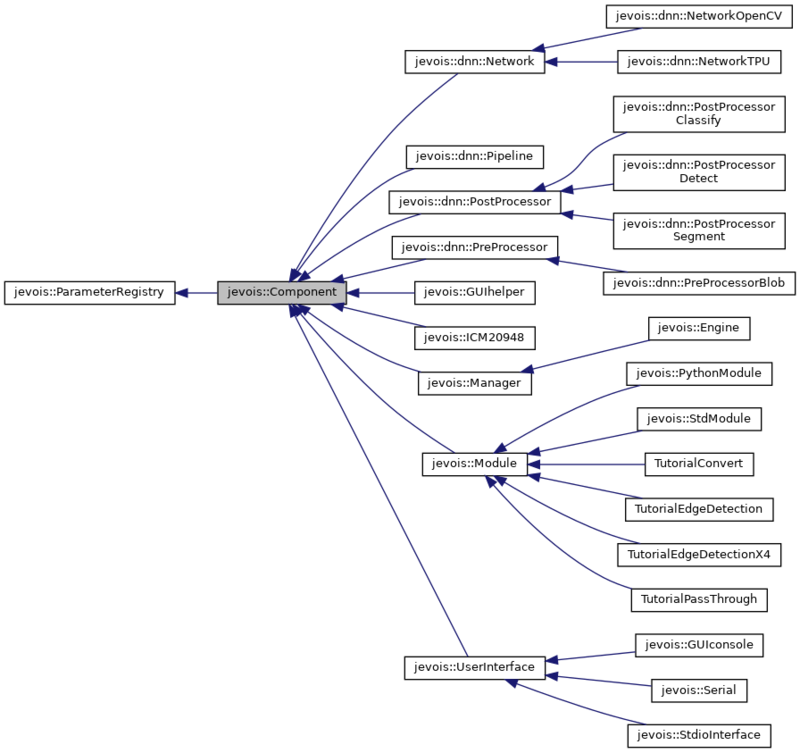 Referenced by jevois::Manager::addComponent(), addSubComponent(), and setParamsFromFile(). Pseudo-constructor: construct and add another component as a subcomponent of this one. A child component of type Comp (which must derive from jevois::Component) will be created and added as a sub-component of this. The child logically "belongs" to this component, and will automatically be initialized, un-initialized, and deleted when the parent component is. In addition to construction, adding a subcomponent will bring it up to the same init() state as the owner component. instance A string identifying a particular instance of a Component, no two sub-components of a component may have the same instance name. The instance name should be passed in through your derived Component's constructor, allowing users to disambiguate between multiple instances of your Component. If the instance name is empty, the actual instance will be named <ComponentClassname># with # replaced (if necessary) by a unique number. If the instance name is not empty but contains a #, only that # is replaced (if necessary) by a number that makes the instance name unique. The final name is accessible via instanceName() once your component is constructed. There is no default value for instance in the base class to catch derived classes that forgot to pass it down to the base, but it may be a good idea to set an empty string default to instance in derived classes. Sub-components always inherit the path of their top-level parent (a top-level component is one that was directly added to a Manager via Manager::addComponent()). See absolutePath(). This is so that different modules can provide different data for their components; for example, a FaceDetector component may require some face template data files to operate; if those are loaded using a relative path name, different modules that use the FaceDetector may use different face template data files. Definition at line 29 of file ComponentImpl.H. References absolutePath(), JEVOIS_TRACE, and LDEBUG. The class name of this component. Definition at line 39 of file Component.C. Get our full descriptor (including all parents) as [Instancename]:[...]:[...]. Definition at line 276 of file Component.C. References descriptor(), JEVOIS_TRACE, and jevois::split(). Referenced by jevois::ParameterCore< T >::descriptor(), descriptor(), and getParamValUnique(). Get a handle to our Engine, or throw if we do not have an Engine as root ancestor. Use with caution as this could break runtime loading/unloading of component hierarchies. Definition at line 129 of file Component.C. References jevois::ParameterRegistry::callbackInitCall(), engine(), JEVOIS_TRACE, LDEBUG, LERROR, LFATAL, postInit(), and preInit(). Referenced by engine(), jevois::Module::frameNum(), jevois::Module::readCamRegister(), jevois::Module::readIMUregister(), jevois::Module::readIMUregisterArray(), jevois::ICM20948::readRegister(), jevois::ICM20948::readRegisterArray(), jevois::ICM20948::selectBank(), jevois::Module::writeCamRegister(), jevois::Module::writeIMUregister(), jevois::Module::writeIMUregisterArray(), jevois::ICM20948::writeRegister(), and jevois::ICM20948::writeRegisterArray(). Definition at line 438 of file Component.C. Definition at line 414 of file Component.C. Get a parameter value, by string. setParamVal for a detailed explanation of the paramdescriptor Use this method to get the current value of a Component's Parameter-related classes and functions from the string descriptor. Values for all parameters that match the descriptor are returned, as string. jevois::exception::ParameterException if no Parameter matches the given descriptor. list of <paramdescriptor, valuestring> for all parameters that matched the given descriptor. The list is guaranteed to have at least one element since we throw if no matching parameter is found. Definition at line 385 of file Component.C. Referenced by getParamStringUnique(), and jevois::Engine::parseCommand(). Get a parameter value by string, simple version assuming only one parameter match. This calls getParamVal(), checks that exactly one match was found, and returns its value as a string. jevois::exception::ParameterException if not exactly one Parameter matches the given descriptor. Definition at line 401 of file Component.C. Get parameter(s) value(s) by descriptor. Use this method to get the current value of a Component's parameter from the string descriptor. Values for all parameters that match the descriptor are returned. list of <paramdescriptor, value> for all parameters that matched the given descriptor. The list is guaranteed to have at least one element since we throw if no matching parameter is found. Definition at line 164 of file ComponentImpl.H. References jevois::ParameterCore< T >::get(), and JEVOIS_TRACE. Get a parameter value, simple version assuming only one parameter match. Definition at line 186 of file ComponentImpl.H. Definition at line 87 of file ComponentImpl.H. Get a sub-component by instance name. This method does a dynamic_pointer_cast to Comp if it is not the default (jevois::Component). Throws if component is not found by instance name, or it is found but not of type Comp (if Comp is specified). Note that once you hold a shared_ptr to a Component, it is guaranteed that the component will not be destroyed until that shared_ptr is released. If the JeVois system tries to destroy the component (e.g., someone calls removeSubComponent()), the component will be un-initialized and its parent will be unset, so it will not be fully operational and will be actually deleted when the last shared_ptr to it runs out of scope. Definition at line 62 of file ComponentImpl.H. Has this component been initialized yet? Definition at line 206 of file Component.C. References JEVOIS_TRACE, LDEBUG, postUninit(), and preUninit(). The instance name of this component. Definition at line 50 of file Component.C. Referenced by jevois::Engine::parseCommand(), and removeSubComponent(). Returns true if this component is top-level, i.e., its parent is jevois::Manager. The Module of Engine is top-level. Definition at line 119 of file Component.C. std::string const & pfx = ""
Get machine-oriented descriptions of all parameters. Definition at line 533 of file Component.C. References jevois::ParameterSummary::category, jevois::ParameterSummary::categorydescription, jevois::ParameterSummary::defaultvalue, jevois::ParameterSummary::description, jevois::ParameterSummary::frozen, JEVOIS_TRACE, jevois::join(), LDEBUG, jevois::ParameterSummary::name, jevois::split(), jevois::to_string(), jevois::ParameterSummary::validvalues, jevois::ParameterSummary::value, and jevois::ParameterSummary::valuetype. Called after all sub-Components are init()ed. Reimplemented in jevois::Engine, jevois::ICM20948, jevois::Manager, and jevois::Serial. Definition at line 467 of file Component.H. Called after all sub-Components are uninit()ed. Reimplemented in jevois::PythonModule, and jevois::Serial. Definition at line 473 of file Component.H. Called before all sub-Components are init()ed. Reimplemented in jevois::Engine, jevois::ICM20948, and jevois::Manager. Definition at line 464 of file Component.H. Called before all sub-Components are uninit()ed. Definition at line 470 of file Component.H. Remove a sub-Component from this Component, by shared_ptr. Beware that the passed shared_ptr is invalidated in the process. A warning is issued if the use_count is not down to zero after that (i.e., there are additional shared_ptr pointers to this Component floating around, which prevent it from actually being deleted. Definition at line 102 of file ComponentImpl.H. Remove a sub-Component from this Component, by instance name. Definition at line 75 of file Component.C. References instanceName(), JEVOIS_TRACE, LDEBUG, and LERROR. Set some parameters from a file. The file should have entries "descriptor=value", one per line, where the parameter descriptors should be relative to this component. If the file name is relative, our component path will be prefixed to it using absolutePath(). Definition at line 454 of file Component.C. References absolutePath(), LFATAL, and setParamsFromStream(). Set some parameters from an open stream. The stream should have entries "descriptor=value", one per line, where the parameter descriptors should be relative to this component. absfile is only used for error messages and should be the absolute path of the file opened in 'is', or some other text for error messages. Definition at line 463 of file Component.C. Referenced by jevois::Engine::preInit(), and setParamsFromFile(). Set a parameter value, by string. jevois::exception::ParameterException if no Parameter matches the given descriptor or if the given string cannot be converted to the Parameter's native type. list of fully-unrolled (no '*') descriptors of the parameters that were matched and set. The list is guaranteed to have at least one element since we throw if no matching parameter is found. Definition at line 358 of file Component.C. Referenced by jevois::Manager::constructHelpMessage(), jevois::Engine::parseCommand(), setParamsFromStream(), and setParamStringUnique(). Set a parameter value by string, simple version assuming only one parameter match. This calls setParamVal(), and checks that exactly one match was found. Definition at line 374 of file Component.C. Note that any [ComponentInstanceName] token can also be replaced by a *, which is equivalent to any number of any ComponentInstanceName specifications. So use the * to reach parameters when you don't know how deep they are. If there is some other ComponentInstanceName between a * and the final paramname, then recursion is turned off and anything between the * and paramname must match intervening components/instances. would match parameters where MyInst matches the top-level component (the one on which you call setParamVal()), then would recurse through any number of subcomponents, until one of them matches CoolComp, and then we would look for MyParam parameter in that subcomponent, and we would not look any deeper. Finally note that there is an implicit first *: that is automatically prepended to your description, so if you just specify a paramname and nothing else before it, we will set all params by that name in all subcomponents no matter how deep they are (as if you had specified *:paramname). std::exception if no Parameter matches the given descriptor. Definition at line 129 of file ComponentImpl.H. References JEVOIS_TRACE, and jevois::ParameterCore< T >::set(). Set a parameter value, simple version assuming only one parameter match. std::exception if not exactly one Parameter matches the given descriptor. Definition at line 152 of file ComponentImpl.H. Assign a filesystem path to this component. Definition at line 501 of file Component.C. Definition at line 446 of file Component.C. Definition at line 426 of file Component.C. Definition at line 480 of file Component.H. Definition at line 479 of file Component.H. Definition at line 481 of file Component.H. Definition at line 478 of file Component.H.